Bus from Ipoh to Singapore has been the major transport for many years. Since late 80’s, many Ipoh residents flocked to work in Singapore to make a living. 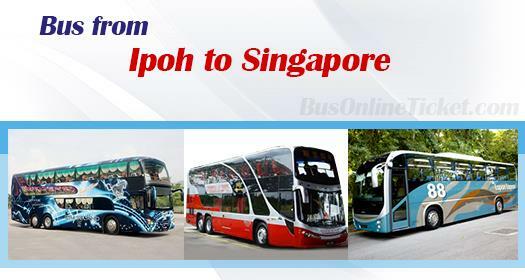 Bus services between Ipoh and Singapore emerge as the important transport for them to travel between the two cities. Grassland, Starcoach, Konsortium, Lapan Lapan, The One Travel are the few operators serving bus from Ipoh to Singapore. They each have their own strength and have their own pool of customers. Grassland is the pioneer operator with strong brand serving the bus from Ipoh to Singapore in more than 30 years. They offer consistent quality service to passengers in the past 30 years. Another Grassland’s strength is their spacious and comfortable sofa seat which ensures passengers having comfortable journey to Singapore. The fare for bus from Ipoh to Singapore is ranging from SDG 33.00 per ticket depending on the brand and bus type. Duration required for bus from Ipoh to Singapore is about 8-9 hours depending on traffic condition. At least 1 washroom break is provided. Departure point in Ipoh was used to be at Jalan Bendahara. However with the opening of Aman Jaya bus terminal, authority has stopped the boarding point at Jalan Bendahara and has given an official order to all operators to provide their service at Aman Jaya bus terminal. Aman Jaya bus terminal is located at Jelapang which is about 10 -15 minutes away from Ipoh city center by driving. Taxi and shuttle bus are available for passengers to travel from Ipoh center to Aman Jaya bus terminal. Taking bus from Ipoh to Singapore is convenient and comfortable. Now it is even more convenient by booking ticket online at BusOnlineTicket.com with instant confirmation. BusOnlineTicket.com emerges as one of the most credible and reputed online booking portal among its customers throughout these years by offering online booking of almost all bus services in Malaysia and Singapore.